Casey Luskin of the Discovery Institute is all up in arms about censorship because, he claims, the Smithsonian-affiliated California Science Center cancelled its screening of the “documentary” Darwin’s Dilemma when it found out that the film was promoting intelligent design. While I agree that censorship is generally not good, Luskin seems to (again) misunderstand that a science center doesn’t want to promote unscientific ideas and that intelligent design is an unscientific idea. That’s been firmly established time and time and time and time again, but Luskin and his compatriots at the Discovery Institute can’t seem to wrap their heads around it. 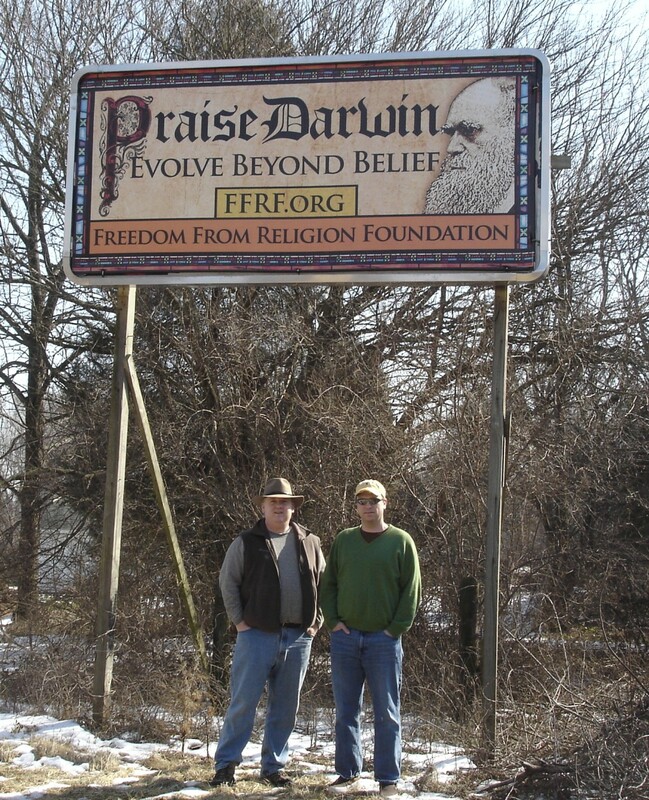 As soon as word of the screening went public the Darwinian thought police started complaining about a government-supported science center renting its facilities to a group showing a film that challenges Darwinian evolution. Why the outrage? Isnâ€™t there academic freedom to express scientific viewpoints that dissent from the evolutionary â€œconsensusâ€? Yes, Luskin. 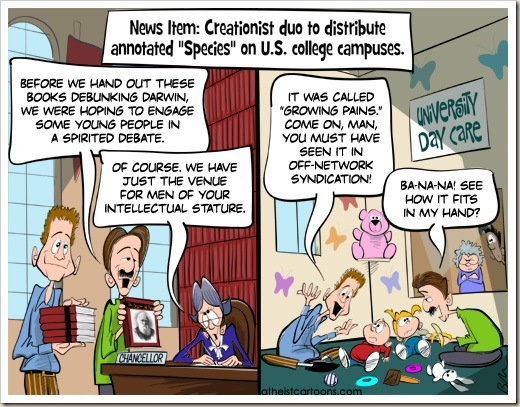 There is academic freedom to express scientific viewpoints that dissent from the evolutionary consensus. The key word is “scientific,” however. Intelligent design is not scientific, no matter how badly you want it to be. Luskin (and the film) attempt to use the Cambrian explosion as evidence for intelligent design, claiming that it poses a problem for evolutionary theory. I don’t want to ruin the ending, but… it doesn’t. Luskin, in true form, sets up a false dichotomy by saying that there are “two ways that modern evolutionists approach the Cambrian explosion” and lists them as follows. A. Some freely acknowledge that the Cambrian fossil evidence essentially shows the opposite of what was expected under neo-Darwinian evolution. B. Others deal with the Cambrian explosion by sweeping its problems under the rug and trying to change the subject. Strangely enough, neither option is correct… or accurate… or honest. The Cambrian explosion is not a dilemma and the reason it’s not is that it hasn’t been swept under the rug, but has been openly (and repeatedly) addressed and shown to fit easily and neatly within the bounds of evolutionary theory. Evidently word hasn’t filtered down to Luskin yet. The other concept that hasn’t reached Luskin yet is that even if science hasn’t discovered the answer for something yet, it doesn’t mean that simply asserting an “intelligent designer” is a valid answer. It’s certainly not even remotely scientific. Luskin goes on to complain about “Darwinian elites” (envy much? ), censorship, harassment, and Carl Sagan. His claims are nonsensical, including the one about a 2004 “pro-ID peer reviewed scientific article by Stephen Meyer (seriously?) and one about Richard Sternberg experiencing “retaliation” for being pro-ID (seriously?). What it boils down to is the fact that Luskin just can’t accept the fact that intelligent design is not science… hence it shouldn’t be presented as science at science-based institutions. It’s not censorship any more than refusing to promote astrology as an alternative to astronomy is censorship. Luskin’s closing paragraphs are where he glaringly makes my point that he just doesn’t get it. Darwinâ€™s dilemma isnâ€™t just about a lack of transitional fossils in ancient rocks. Itâ€™s about how the guards of evolutionary orthodoxy will treat contrary scientific viewpoints. Will they silence minority views, or will they grant dissenting scientists freedom of speech and scientific inquiry to make their case? Evolutionary scientists welcome contrary scientific viewpoints. 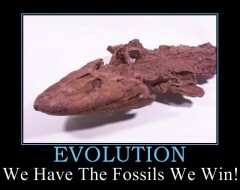 They actually debate the fine points of evolution constantly and review new scientific ideas. Dissention is welcomed, but the key word (again… and still) is “scientific.” That’s where Luskin and his Discovery Institute peers get left in the dust. They’re not scientific. Intelligent design is not science. As much as they want to believe it, saying it over and over again does not make it true and the more they do it, the more they make a mockery of themselves. …which is something, it seems, they do on a regular basis. 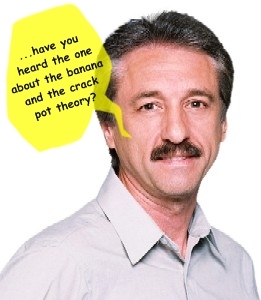 Ray “The Banana Man” Comfort -VS- …The Vatican? BM suggests (in his support of Genesis) that Darwin’s theories are, “fantasy â€“ a ridiculous and unscientific fairy tale for grownups.” Yes, one of the biggest evangelical proponents of creationism (Adam’s “rib”+ God =Woman) believes that Darwin’s theories are a, “…fairy tale for grownups”.Â Truly boggles the mind. The story ends with a commercial to promote the sale of BM’s books.Â He has written overÂ sixty. Nice little business BM has going.Â Remember what Jesus said BM, â€œIt is easier for a camel to go through the eye of a needle, than for a rich man to enter into the kingdom of Godâ€ I know it’s true because Jesus said so! IÂ couldn’t possiblyÂ count on all of “God’s” appendages how many crazy fundie opinions I have read or heard through the years,Â Â but this one might take the cake. Sean McDowell at WorldViewTimes.com has written a brilliant article on the recent “Monkey Attack” in Connecticut. HisÂ articleÂ Â ingeniously illustrates why Charles Darwin was directly responsible for this animals savagery. Nevertheless, we need to ask a basic question: How could something like this happen? How is it that we live in a culture where people think it’s safe to have a chimpanzee as a pet? Where do people get the idea that we ought to take a wild animal and treat it like a human being? The chimp owner treated the animal like a son who ate at her table, slept in her house, and even drove her car. Ideas do not exist in a vacuum. In fact, there is one culprit for the idea that human beings and chimps are really not that different and should be treated that way: Darwinism. These are just the B listers from the United States.Â Did Sean forget that even humans are capable of “animal like” savagery? Sean’s expedition into the absurd ends with a condemnation of “Darwinism” being wrong (a little presumptive) and corrosive (unlike Christianity, which in all of it’s history never hurt anyone… *wink*… *wink*). Considering some of the humans God saw fit toÂ include in his plan forÂ the earth, I think Sean owes all chimps an apology for comparing them to mankind. 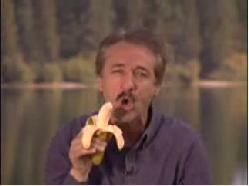 Anyone who’s seen Ray Comfort speak or has read anything he’s written knows pretty well that he’s a couple bananas short of a bunch. Aside from the mind-dizzying irrationality of his assertions, he moves firmly into the land of untruth when it comes to speaking about the Theory of Evolution. 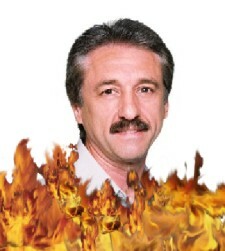 So far so, that according to Ray’s own preaching, he’s going to Hell. You’ve heard his shtick. It’s the same one that Kirk Cameron uses. He’ll approach someone and ask him if he’s a good person. Then he’ll proceed to ask if the mark has ever lied, stolen, taken the Lord’s name in vain, or committed adultery (based on his biblical definition). Of course, then he’ll tell the mark that he’s a lying, blaspheming, adulterous thief and is going to Hell… unless… and then Ray gives the whole Jesus solution. I recently watched a YouTube video of Ray doing some open-air preaching in what might be Huntington Beach (he preaches there a lot, evidently). After the regular bit mentioned above and some of his classic religion-based drivel, he starts talking about evolution and goes way off into the realm of grand liars. 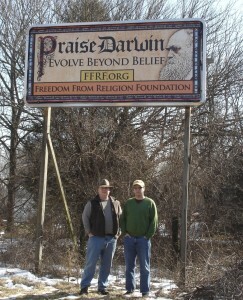 Today, I went to visit the new Dover, PA “Praise Darwin” billboard with Craig, my co-writer on this site, to take a few pictures. It took us a bit longer than we expected to find it because we were heading north and the billboard is viewable for south-bound drivers. I kept looking, but when driving north, it’s hidden behind a grove of trees, so I missed it, but it was easy to spot on the way back. It’s actually very unobtrusive (much to our dismay! ), but is very tasteful. It makes the complaints by area residents seem all the more silly considering you’d have a good chance of missing it if you weren’t actually looking for it. So that’s me on the left and Craig on the right. Later this month, the Freedom From Religion Foundation is going to organize a larger group photo with as many area members as they can muster, so perhaps I’ll have another photo to post after that takes place. It should be good fun meeting other members in person! My aforementioned letter to the editor of my local paper was way over the word limit for letters, so someone from the paper called me to tell me that they were goint to run it as a guest Op-Ed piece instead. I was delighted! It’s in the paper today (and in the online version, obviously). The comment area is enabled at the newspaper’s site, so feel free to leave comments there (or here!). 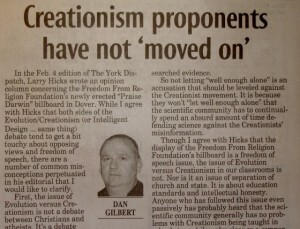 I’m very excited that my response made publication… even if it is just a local paper.